Terrazzo is a solid flooring material made with chips of marble or other stone pieces set in a cementitious or resinous binder. 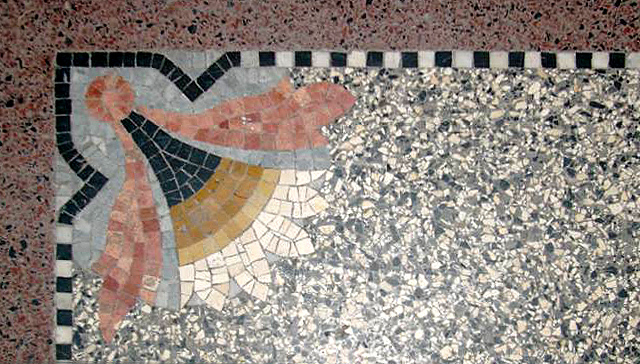 After the terrazzo has cured, it is ground and polished to a shiny and durable finish..
Ter­raz­zo was orig­i­nal­ly invent­ed by Venet­ian con­struc­tion work­ers as a low cost floor­ing mate­r­i­al using mar­ble chips from upscale jobs. The work­ers would usu­al­ly set them in clay to sur­face the patios around their liv­ing quar­ters. Con­sist­ing orig­i­nal­ly of mar­ble chips, clay, and goat milk (as the seal­er), pro­duc­tion of ter­raz­zo became much eas­i­er after the 1920s and the intro­duc­tion of elec­tric indus­tri­al grinders and oth­er pow­er equip­ment.